The Economic and Financial Crimes Commission (EFCC) has blocked the account of Ekiti State Governor, Ayodele Fayose, operates with Zenith Bank Plc. 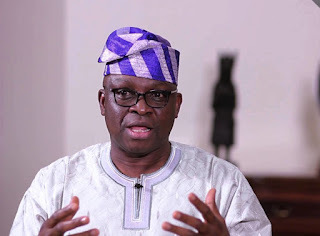 The governor, who spoke to reporters in Ado-Ekiti on Monday at the premises of the bank, said he had information that the accounts of some of his associates were also affected. According to a press release by the Chief Press Secretary to the Governor, Idowu Adelusi, the governor accused some leaders of the All Progressives Congress (APC) and a prominent lawyer from the state of being the brains behind the action. While condemning the action, Mr. Fayose said under the constitution of the Federal Republic of Nigeria, especially th‎e provisions contained in Section 308, he enjoyed immunity and wondered why his personal properties should become the targets of the Federal Government and its agencies under the guise of fighting corruption. “Section 308 of the 1999 Constitution gives me immunity just like the President. I wouldn’t know why these people are intolerant of others and in a haste. Let them wait till 2018 when I will end my tenure for them to do their investigati‎on. The other time the EFCC accused me of embezzling N1.2 billion poultry project fund, I was the one who voluntarily reported myself to the EFCC. “Even the President cannot claim to be an angel. The estate he built in Abuja is known to us. His wife was indicted over the Halliburton Scandal. When that American, Jefferson, was being sentenced, the President’s wife was mentioned as having wired $170,000 to Jefferson. Her name was on page 25 of the sentencing of Jefferson. We can serialize the judgment for people to see and read. “Those who th‎ink they can silence me are mistaken. I am a person who is not perturbed by things like this. Let them wait till 2018 when I will finish my term and I will be the one to go and meet them. I won’t run away and let them investigate the whole world, I have nothing to hide or fear,” he said. Mr. Fayose said he would challenge the action appropriately.